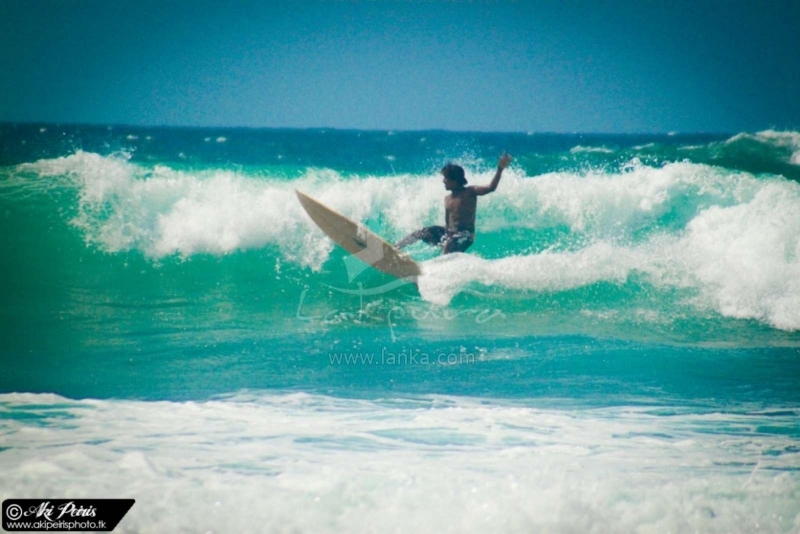 Surfing & Windsurfing is a popular water sport among foreign tourists who visit the palm fringed pristine beaches of Sri Lanka. 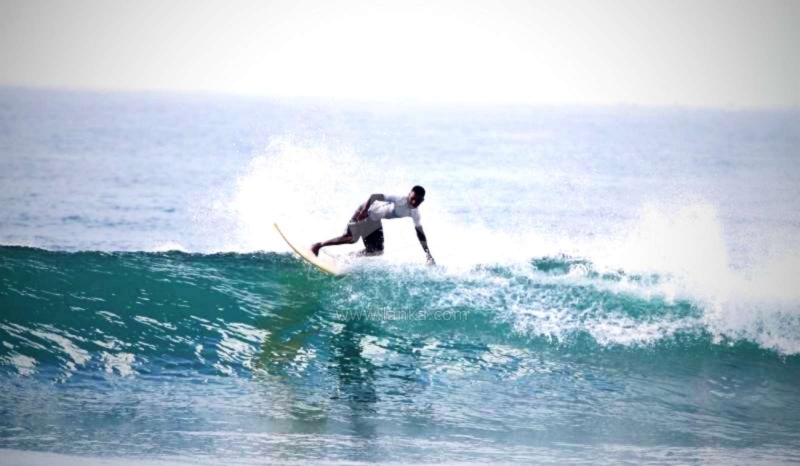 The most popular surfing beaches of the island are Hikkaduwa of the South Western coastal belt and Arugam Bay (which is an International surfing competition venue) of the Eastern coastal belt of Sri Lanka. 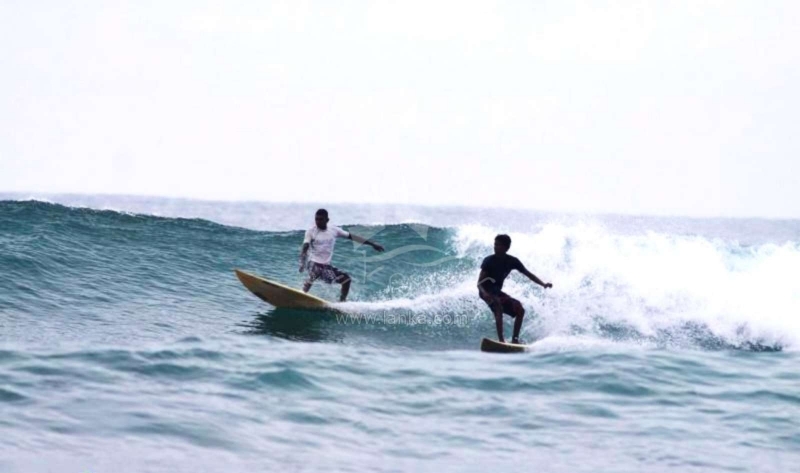 Since the early 60’s, Sri Lanka has attracted surfers from all over the world. The windsurfing opportunities offered in Sri Lanka attracts amateur windsurfers as well as world class windsurfers participating in international windsurfing competitions. (a) Sri Lanka being a tropical island, the windsurfer does not need to wear protective clothing against the cold winds that might be encountered on the beaches. However, a protective coating of lotion would save your skin from the bright tropical sun when surfing the Indian Ocean. (b) Sri Lanka affords the opportunity to locate a windsurfing beach in line with the skill level of the windsurfing enthusiasts: from beginners to the Professional Windsurfer. The tranquil waters of the Bentota river or any of the coastal lagoons or Sri Lanka’s ancient vast irrigation reservoirs offer ample opportunities to every novice so that he / she would dare taking the challenge of the ocean. (c) Sri Lanka’s windsurfing tour packages offered by tour operators and wind surfing clubs are affordable in comparison to the major windsurfing destinations around the world. 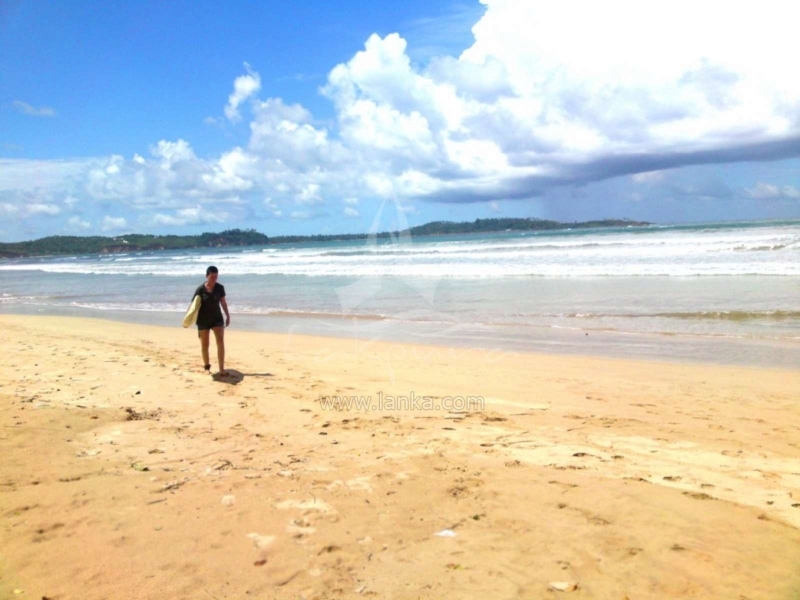 For beginners of windsurfing, Bentota which is located along the south-western coastal belt offers windsurfing facilities, such as the hiring of boards and sails. The Club Intersport and Sunshine Watersports Centre are the main facilities that provide you with support. Sunshine Watersports Centre is the only VDWS (Association of German windsurfing and watersport schools) – certified surf school in the island providing the necessary training and professional certification. Sri Lanka’s climate is such that the tropical island is hardly out of season for windsurfing. However, the main seasons are during November to April along the South western and Southern coastal belts and April to September along the Eastern coastal belt. The windsurfing clubs and hotels in these windsurfing beaches are always at hand to advise on strong currents and undertow whenever and wherever those exist. "Never do it if you don’t have the experience, never do it alone and have a supervisor at all times and check with the local authorities to see if the weather and sea current conditions are right to windsurf. The new trend is to go kite-surfing but do it at approved centres because it takes a great deal of skill and expertise to do it." Thushal Gunawardena, (ranked among the top 10 at the World Windsurfing Championships of 1992), Sunshine Watersports Centre, Aluthgama, Sri Lanka. The South-western and Southern coastal belts are studded with fine palm fringed sheltered tropical beaches. Some of these bay beaches, i.e. Bentota, Hikkaduwa, Tangalle etc. 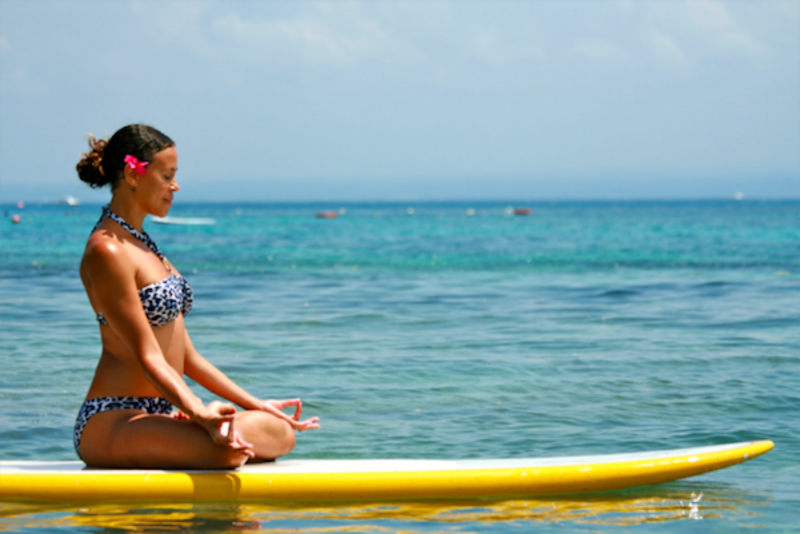 are also enriched with lagoons enhancing opportunities for the amateurs to enjoy water sports. The main tourist season of Sri Lanka is during the period of November to April. During this period the lovely beaches of the South-western and Southern Coastal belts of Sri Lanka are bustling with activity; hotels are bulging with guests. Bentota, Hikkaduwa, Midigama, Polhena and Tangalle Beaches are the most popular windsurfing beaches. The Hikkaduwa beach which is protected by a reef is famous for windsurfing, beautiful sea corals, diving, fishing & also its golden sandy beaches. 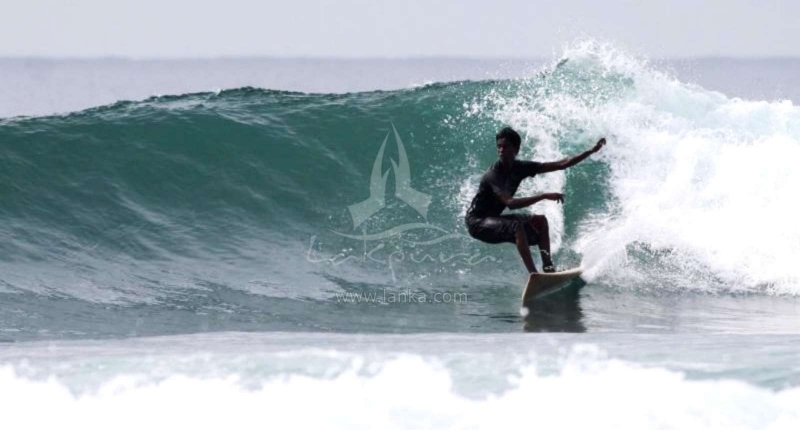 Hikkaduwa beach offers 4 surf points with clear warm waters to the windsurfing enthusiasts. All four surf points have a deep bottom and flat reef. During the season the wave sizes range from 2 to 7 feet. Bentota of the South-western coast is a wind surfer’s paradise: the waves, the surf, blue waters and the palm fringed sandy beaches all bring about an exhilarating beach experience. The Bentota lagoon and the river afford ample chances for the amateur windsurfers to learn the ropes of the sport so that they could venture into the ocean for some serious windsurfing activity. Coral bottom. This is a wave that requires a great swell that breaks. When this wave behaves in its regular pattern it can be a wonderful windsurfing ride: it’s a long wave with very hollow sections. Coral bottom. 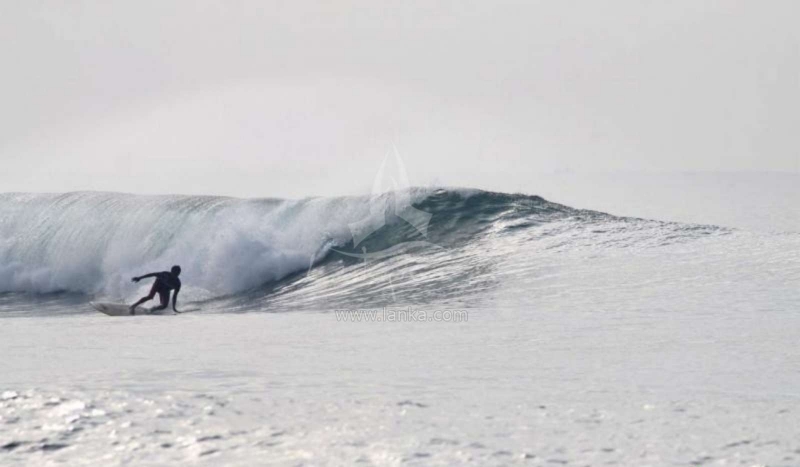 A fast left wave and quite dangerous that breaks over a very sharp reef and with shallow water. Only surf here if you really know what you are doing and at your own risk. Coral bottom. The spot offers right and left waves to have fun and relaxed surfing. (a) Coral bottom with beach break. Breaking fast hollow waves from left and right can be quite intense at times. (b) Sand bottom. Towards the south of the Inside Reef there are a number of thin sand bottoms over which several types of waves break. This area is recommended for the inexperienced surfer. Hikkaduwa lagoon affords the amateur windsurfers to learn the art of windsurfing prior to launching themselves into the ocean. Windsurfing in Sri Lanka is not confined to its beaches. Coastal lagoons too are popular among tourists bent on windsurfing in Sri Lanka. Some of the lagoons in the South-western and Southern coastal belt of Sri Lanka afford year round opportunities to enjoy this activity. The Kalutara lagoon, Bolgoda lake and Negombo lagoon feature prominently among these windsurfing options. Negombo beach affords the opportunity to windsurf all year round. During the months of January to March, the shore breaks demands some experience in windsurfing. However, during the rest of the year, the Negombo beach is well suited to the beginners in Windsurfing: on good days they would enjoy 6 beaufort [ wind speed-39–49 km/h- strong breeze; wave height 3–4 m; long waves begin to form; white foam crests are very frequent; some airborne spray] with an average of 4-5 beaufort. The Negombo Lagoon, with the wind blowing across the lagoon regularly, remains an ideal place for the amateurs to learn the ropes of windsurfing any day of the year. The Eastern coastal belt of Sri Lanka is home to endless wild beaches of white sand and shallow waters with coral islands. Behind the beaches are lagoons in wilderness. The beach at Arugam Bay is among the most popular windsurfing beaches of the world. Since the Eastern coastal belt, unlike the South-western and Southern coastal belts, isn’t yet developed comparatively, accommodation options and facilities for water sports are minimal. 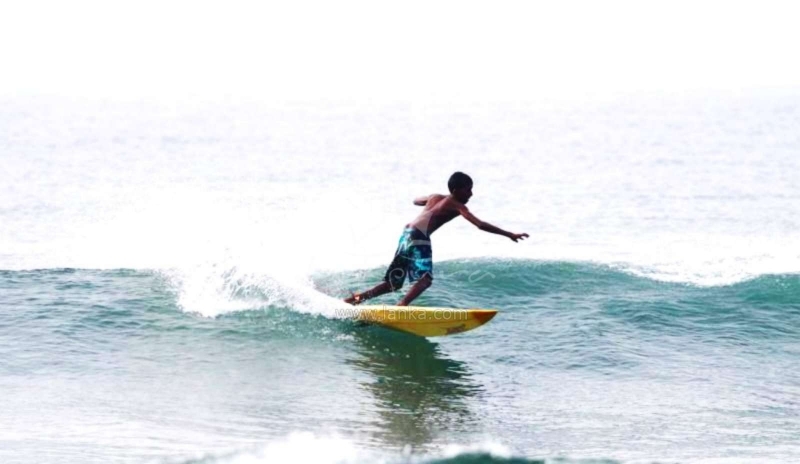 In addition to Arugam Bay, the windsurfing enthusiasts may well head to the waters towards the north of Trincomalee in Nilaveli & Uppuveli which offers fine beaches with lovely surf. Arugam Bay on the Eastern Coastal belt of Sri Lanka is a world class professional windsurfing beach: it is often cited among the top 10 surf spots of the world. 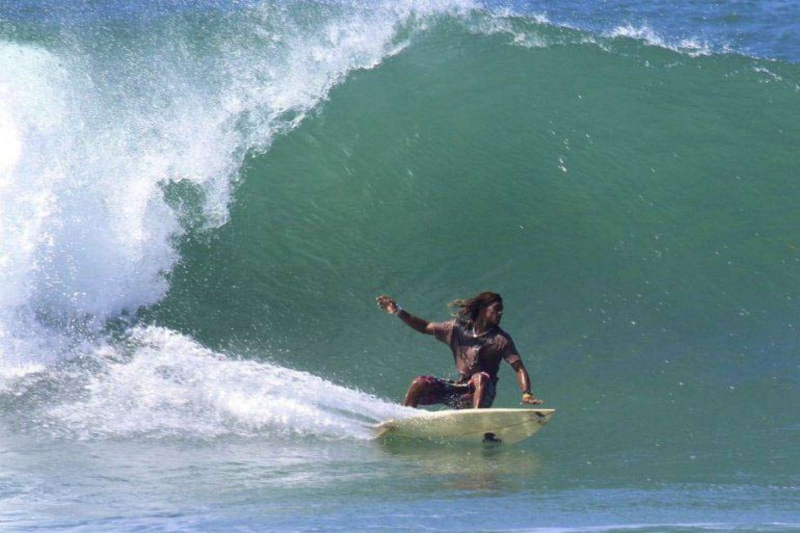 While the surfing spots feature a consistent swell, long runs, permanently warm (28C) crystal clear waters, the stretch of lovely sand, being devoid of luxury hotels, affords laidback beach holidays on budget accommodation in a casual atmosphere. 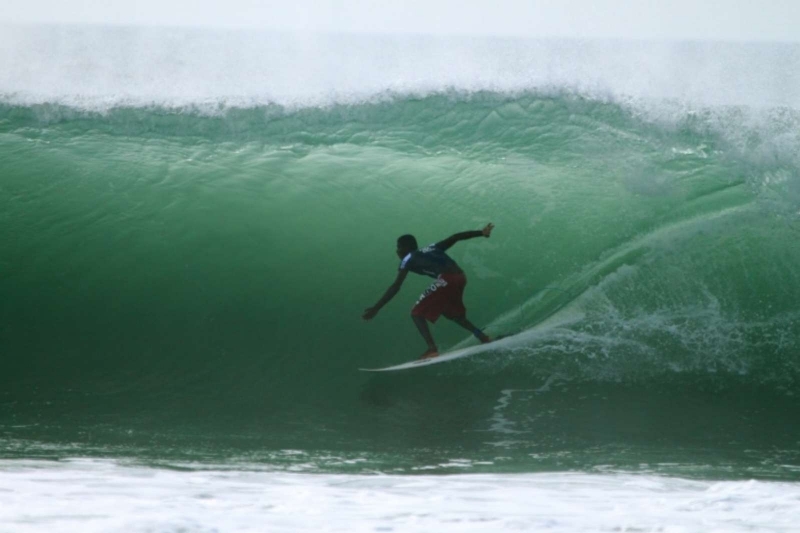 Association of Surfing Professionals – (ASP)’s International wind surfing competition held in Arugam Bay in June, 2010 turned out to be a great success ending up with Australian windsurfer Julian Wilson winning the competition. A variation of windsurfing which is catching on fast in Sri Lanka is kite boarding. For this sport smaller boards are used with the surfer attached by a harness to a large kite. The speeds achieved are similar to that of windsurfing, the difference being the massive jumps that are possible.